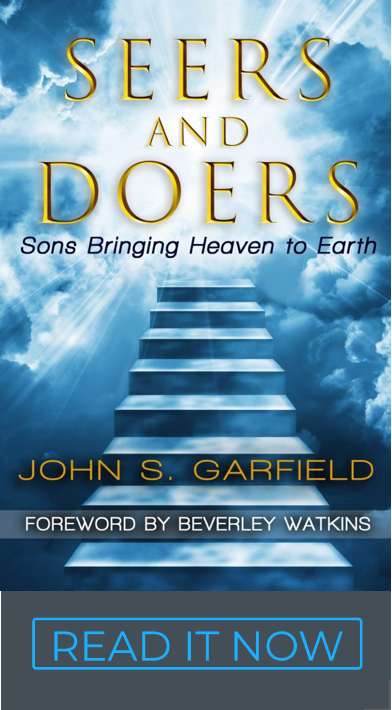 You will enjoy reading Seers and Doers. The “manor lords and serfs” narrative has long been a cultural fact of life from the middle ages to modern corporate, political, and social hierarchy. The “Serf Mentality” is necessary to sustain oppression. The David Brin quote is secular and prophetic at the same time. It points to the next reformation and the freedom God’s Kingdom brings to cultures and nations. It’s a bottom-up, heart-driven process. People can be liberated from oppression, but if their serf mentality is not changed, they will find another tyrant like a moth drawn to the flame. As Serfs, we can be our own worst enemy. Wars, revolutions, and elections will not save us. Worse yet, we carry our serf mentality into our relationship with God and assume He loves worshipful allegiance, self-depreciating humility, and sacrificial obedience. Our Father is looking for sons to relationally populate His council in heaven and displace principalities on earth i.e., heroic overcomers who can do exploits and triumph in warfare. The Kingdom is much more about collaboration, cooperation, initiative and co-laboring than we thought! I hear the stories of many businessmen trying to explain their success in terms of sacrifice, “God told me to do it.” It sounds spiritual like we’re really connected with God, but it’s often a cover for a disconnected heart. The serf offering of sacrificially doing what our heart doesn’t enjoy is not a sustainable path to life. Obeying a list of instructions is not a good reason to do anything. We must know our and our Father’s why, and our initiative has to flow from our own heart as well as our Father’s heart. The transition from serf to son – 1) When we first meet Jesus we hear something in our hearts that says, “follow me.” So, we do. It’s simple obedience, we welcome mentoring and pastoral oversight, and we grow because of it. 2) As time goes by and we test our wings and experience success and failures in our faith, we also are brought to a place of brokenness. We lose our desire to have our own way and yearn for His way. 3) In the third stage, we receive an invitation from the Lord to transition from servant to friend. Just when we drained ourselves of initiative, God invites it back, and we find a place where our will and His will overlap in the desires of our own heart. That overlap happens in His council when we hear the strategies of Heaven and loose them on earth. 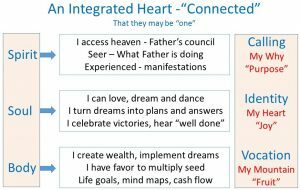 What “Connected hearts” look like – God made us in His image with three parts: spirit, soul and body. Being connected means those three parts of our being are integrated and pulling in the same direction. My spirit is designed to access heaven, participate in His council and play my role in bringing heaven to earth. My seer gift is activated to see what my Father is doing. That’s my why! My soul is rejoicing in God. I can love and dream and dance. I can turn dreams into plans, celebrate victories and hear my Father say, “Well done!” It’s fun! On earth, I can implement those dreams and the desires of my heart with my Father’s authority. I can access the wisdom to create wealth, multiply seed and manage my metron. It’s fruit! The result is that in one package (me), I understand why I’m here, I know who I am, and I’m engaged in fulfilling destiny in my mountain. I’m integrated within myself; I’m one with my Father and one with the brothers and sisters with whom I work and worship. If I get stuck in all spirit, I end up dysfunctional: struggling with finances and relationships because I only value spiritual things and despise the practical. It’s all theory, prophecy and teaching and no application (empty clouds and clanging, religious cymbals). Men can’t connect with leaders stuck in spirituality. If I get stuck on a soulish level, I can be intellectual, theological, unloving, philosophical, proud, political, ego driven, self-centered and starved for attention (narcissism). If I get stuck in the physical realm, I can be carnal, greedy and display an addictive lifestyle. I can access Father’s courts and council – My lifestyle has switched to walking in a spirit of repentance because of my experience in His courts. I accept the invitation to my Father’s council. I can hear the strategies, see what the Father is doing and bring heaven back to earth. I have the keys to heaven’s storehouse (Mt 13:52) and I can bring my inheritance to earth and build the Kingdom with my Dad. I can connect the dots between my vocation or business and my Father’s Kingdom purpose. I can be myself – Getting in touch with your heart is learning that it’s OK to be you. It’s OK to sort through wrong heart beliefs and motives to get the right ones. Our choices are to ignore them, hide them or fix them. Ignoring them looks like religious privacy all the way to a pharisaic cover-up—hypocrisy. Hiding them looks like a minefield waiting for an accident. Dealing with them and the feelings that go with our heart beliefs feels like being human, forgiven, a son of God. Transparency – When we are connected with our own hearts and we deal with the issues, there are no secrets. We can admit to ourselves and others what our heart’s desires are, how they are changing and where there have been struggles. It frees us to be very natural and open with other people. One other little secret – everyone on earth can tell if we’re connected or not. When people complain about hypocrites in church, they are not really pointing to the occasional Pharisee. They are pointing to the fact that most Christians are not connected with their hearts . . . disconnected believers are driven by a standard set by others (even God’s law) that is not “natural” even for them. Enthusiasm – Connecting with our own hearts and ridding our lives of boundaries and baggage frees us to really be passionate, creative, excited, fulfilled, prosperous . . . all the ingredients that flow right out of our storehouse in heaven (Mt 13:52). Finally, our lives naturally flow and work. The greatest place to look for the will of God, biblically and practically, is right inside the desires of your own heart. Obedience alone does not define spiritual maturity for a Christian. Freeing others – The next thing that happens is that we start accepting other people where they are. We can help them get in touch with their hearts. It’s much easier to see their heart’s desires and help them make progress. In fact, it’s much easier to be prophetic. This whole process helps us access the heart of God and the hearts of other people. It’s very prophetic and helpful in practical ways. Most of all, it feels like love. When we know one another at a heart level and share our deepest heart’s desires, it’s very easy to love one another. We can see the good things God has written in their hearts instead of just the baggage from the past. Leadership – I’m aware of my own strengths and direction and have the same awareness of those around me – their heart’s desire and direction. It becomes very natural to put the puzzle pieces together and form a team, delegate and organize around our hearts. Other people feel appreciated and valued and respected. It’s great for business. We are not peacekeepers as much as peacemakers. Our leadership releases creativity, initiative, passion and teamwork. Listening – We learn to hear what a person’s heart is saying rather than just focusing on their words and actions. Hurting people often camouflage their true heart beliefs with very pious words and deeds. Instead of reacting to their cover, we can see God’s writing on their hearts and help them connect with their true heart and with God’s heart. I’m not listening to their words as much as hearing their heart. Divine encounters – It becomes very unnatural to just share “our” information. We see people where they are in terms of being connected with their hearts and share only those things that might help them take the next step (their information). We’re helping people connect to an experience with the Holy Spirit that will justify a heart change. Gifts often flow through us for their sake . . . particularly the prophetic and wisdom. The process of helping another person with Jesus as the third party is so much fun that we are emboldened to “go to the back row” to reach out to those who need help overcoming the boundaries in their own hearts. Accountability – Accountability from others or self-discipline from within simply doesn’t work if I’m working against my heart. Real accountability is me holding you responsible for your own heart’s desires and dreams – something you are already motivated and created to do (by God). The traditional view is that I would hold you accountable for my vision and agenda instead of yours. Networking – Once we both understand the other’s heart direction and goals, it’s an easy next step to network those who can help you to take the next step. Networking is a huge follow-up component to being connected with your own heart. If feels like we keep meeting people we already knew. It’s also a very practical business advantage. One of the by-products of coaching is that we see one another’s heart plan. I’ve become personal friends with everyone I’ve coached because relationships are a natural byproduct of heart connections. The greatest insight is that people who are connected with their own hearts are successful in business, in life, and in relationships. Great accomplishments are preceded by connected hearts and motivated people who are doing what they naturally enjoy… fulfilling a Kingdom destiny because they have tapped into the reason they are here. Their work is worship and their accomplishments are crowns laid at the feet of Jesus. “They” is us… we’re destined for something great, each one of us. If you enjoyed this topic, Connecting With Kingdom has more.